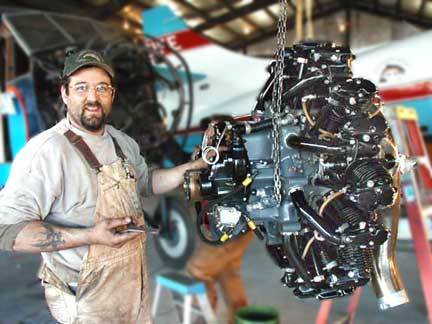 Greg Tompson installing the engine. overhauled in Georgia by Wright guru Mike Connor. was a 220 hp whirlwind of the type used by Lindbergh. by fitting the airframe with a 330 hp Whirlwind and approving it for floats. went on in 1946 when the wartime engines became available after WW2.